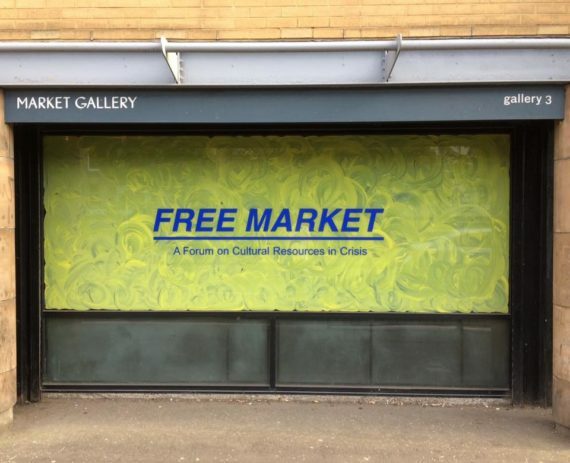 Over the course of three days, Market Gallery hosted numerous arts organisers, artists, journalists, writers, economists and activists from across Scotland & the UK. Initiated partly as a response to losing two of our gallery spaces at the end of May, we wanted to problem-pose the underlying issues behind the allocation of resources and property within the arts & wider cultural sphere. The aim of the forum was to understand and critique the structural complexities and collectively search for potential alternatives or solutions. Who and what determines how cultural resources are distributed, and for what purposes? What are the effects of privatisation on the arts? How can we actively transform art, work & culture for the better? 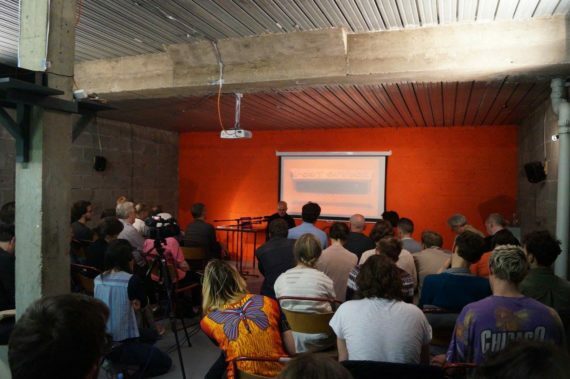 How can we build radically new forms of collective, cross-cultural organisation? First and foremost, what is knowledge when it is “free”? 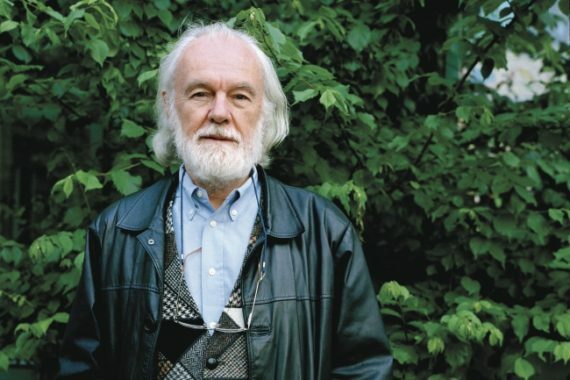 Whether there are sites, such as the spaces of art, in which knowledge might be more “free” than in others? What are the institutional implications of housing knowledge that is “free”? 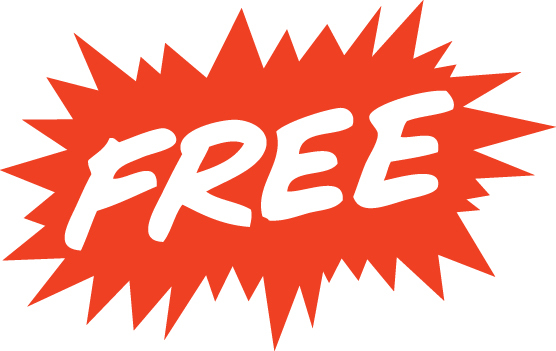 What are the economies of “free” that might prove an alternative to the market-and outcome based and comparison-driven economies of institutionally structured knowledge at present? These are the guiding questions that Goldsmiths academic Irit Rogoff uses in her essay “FREE.” Beginning with her provocative thought experiment: a proposal she gave to the university to create an adjacent free academy called “Goldsmiths Free”, she speculates about how it would change the nature, status and affect of the knowledge shared. She writes that “the notion of ‘free’ is currently so degraded in terms of the free market, the dubious proposals of the new ‘free economy’ of the internet, and the historically false promises of individual freedom, that it may be difficult to see what it might have to offer beyond all these hollow slogans.” Against this degradation, Rogoff refers to her idea as the unframing of knowledge. “When knowledge is unframed”, she writes, “it is less grounded genealogically and can navigate forwards, rather than backwards.” In her forward march, she simultaneously expresses a frustration at the internal limitations of the art world, with it’s tendency to reduce intellectual pursuits to illustration, or to turn them into “aesthetic tropes when in the hands of curators hungry for the latest turn.” Ironically we could ask: does her own essay fit within what has undoubtedly been referred to as a recent “pedagogical turn” in the art world? Yes it probably does. It’s only a matter of time before it shows up on pedagogical reading lists such as this one by School of the Damned class of 2017: https://issuu.com/schoolofthedamned or cited in pamphlets such as the most recent STRIKE! Magazine issue on radical pedagogy: http://strikemag.bigcartel.com/product/strike-issue-19-autumn-2017. It’s in this penultimate chapter that she could almost have been describing the form and function of the Free Market Forum, and the knowledge it gathered together. She admires in these spaces of learning for example, the centrality of the “who” that poses the questions, “where they are speaking from, and from where they know what they know.” This kind of subjective disclosure and direct relatability to the speaker’s’ political or social position, whether in the area of the housing market (Laurie Macfarlane & Helen Moore), the archival, community oriented and intimate projects of Carla Cruz & Jonathan Hoskins, or the introduction to Glasgow Autonomous Space provided by Natalie, can be said to have grounded the forum in an intellectually accessible, unpretentious way. The jumbled, multiple, subjective layers and identities presented haphazardly throughout the Free Market Forum are analogous to Rogoff’s assertion that such collective spaces of learning grant permission “to start in the middle without having to rehearse the telos of an argument; to start ‘right here and right now’ and embed issues in a variety of contexts.” This cannot be said necessarily for the specific content of each and every talk, but the various forms of knowledge expounded existed as disjointed multiplicities of information, stemming from different, even oppositional traditions, schools and approaches. This became evident for example, listening to Sarah Strang’s talk immediately after Neil Gray’s critique… Rogoff’s final relatable observation and distinction between these unselfconscious, unframed spaces of knowledge production and normative institutional conference styles is a reconfiguration of what is meant by “the curatorial.” In these spaces such as Market Gallery, the curatorial can exist “not as a profession but as an organizing impulse”, which “opens up a set of possibilities, mediations perhaps, to formulate subjects that may not be part of an agreed-upon canon of ‘subjects’ worthy of investigation.” Events like the Free Market forum, then, if successful, can “serve both the purposes of reframing and producing subjects in the world.” The continuity, and perhaps now the legacy of such forums within the Market Gallery programme will live on in the regular “Night School” events held at the gallery, which by the way, are always free to attend. Casting aside gloomy critiques of economic systems and the instrumentalization of culture for the moment, there are a few more obvious, more positive, abstract elements of the forum format still left to outline. Regardless of whatever opinion we might have about the specific ideas expressed during the event, or its perceived success (it’s not really my place to pass judgement), there is I think something valuable in the simple act of convening a public gathering specifically to discuss matters of public concern, such as the allocation of cultural resources. This is especially true, given the social and economic context that we are living in, which generally does not easily support such events. Our public spaces and venues, galleries, libraries, pubs, community theatres, community centres have been routinely privatized, dismantled, closed, or requisitioned in order to turn a profit or refurbished for purely utilitarian purposes. Public funding for the arts has been consistently slashed by the Government’s austerity programme, budgets at times reduced to 0% in places like Newcastle. In this publicly restrictive privatised context then, rare spaces such as artist-led, publicly funded, community supported galleries can become islands of relative freedom. As I’ve already remarked, they can also more easily politicize local events affecting them or their community than the larger institutional behemoths can. But what do I mean by politicize here? Is it possible to say that the Free Market forum politicized it’s own problematic circumstances? 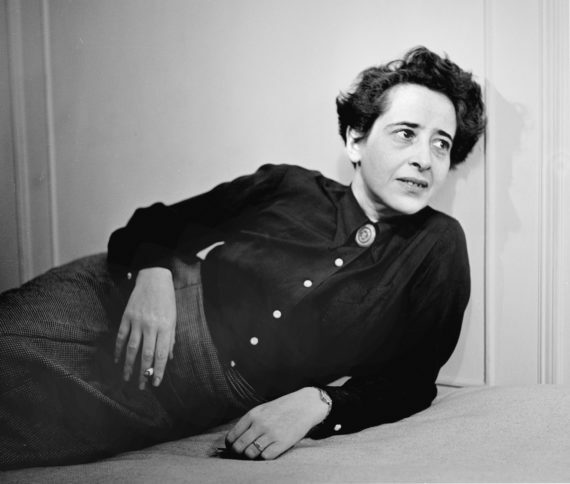 The way that I had always conceived of the project in my own mind, perhaps overly romantically, related directly to my attempts at reading Hannah Arendt’s theory of Action. To be clear, I am not claiming that Free Market was an adequate manifestation of her theory! And yet thinking about her notion of action and “space of appearance” did resonate and quietly maintain my interest during the forum’s organisation. OK, the east end of Glasgow is hardly one of these superstar Airbnb hotspots, but it has received its fair share of galleries, hipster coffee shops and studio spaces; most recently MANY Studios in the Barras for example. Older more established gallery spaces such as Market Gallery belong to the Blair years, when subsidies for large and medium scale artistic redevelopment ran wild across the country. “Tony Blair’s Labour government was particularly obsessed with turning factories into cultural attractions. In a fit of urban regeneration between 1998 and 2002, the United Kingdom constructed galleries in former industrial spaces all over the country, from London’s Tate Modern, housed in a former power station, to the BALTIC art gallery, an old flour mill in Gateshead, as well as the Manchester Lowry Museum and the Tate Liverpool, each built on former docks.” Yet the comparison of Market Gallery and the birth of institutions such as Tate Liverpool cannot be so lazily passed over. In Market Gallery’s case, the story is in many ways more complex; since, while it rode the wave of this national creativity fix gallery building trend, it was loaned property from Reidvale Housing Association, a once radical, entirely community owned housing project. The fact that these projects and creativity fixes, initiated during the Blair years have taken on a life of their own therefore also need to be adequately addressed by anyone seeking to research them, including Richard Florida himself. Catalina Barroso-Luque is a Glasgow based Mexican artist, writer and curator. Her work revolves around how text and technology transverse bodies – her own and those around her. 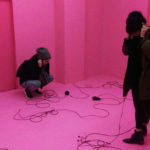 Projects evolve out of extended research, artistic and curatorial processes where writing, making and discursive interactions with practitioners in other fields infect and inflect each other. Catalina holds an MFA from the Glasgow School of Art and was the 2016 Glasgow Sculpture Studios Graduate Fellow. She has worked on projects at the Glasgow Women’s Library, Edinburgh Art Festival, Glasgow International, Chalton Gallery (London), CCA (Glasgow), Salon ACME (Mexico City), Art Space (New Haven) and Market Gallery (Glasgow). Her texts have been published by MAP, Panel, Birkbeck University and PSS London.